MetLife Foundation’s longstanding partnership and philanthropic support of Accion’s work, and our joint public engagement efforts, have raised awareness of the opportunities and solutions to advance financial inclusion. Since 2013 MetLife Foundation’s core focus has been to improve the financial health of low-income individuals across the globe. Together, we’ve helped underserved people around the world gain access to the tools they need to improve their lives. 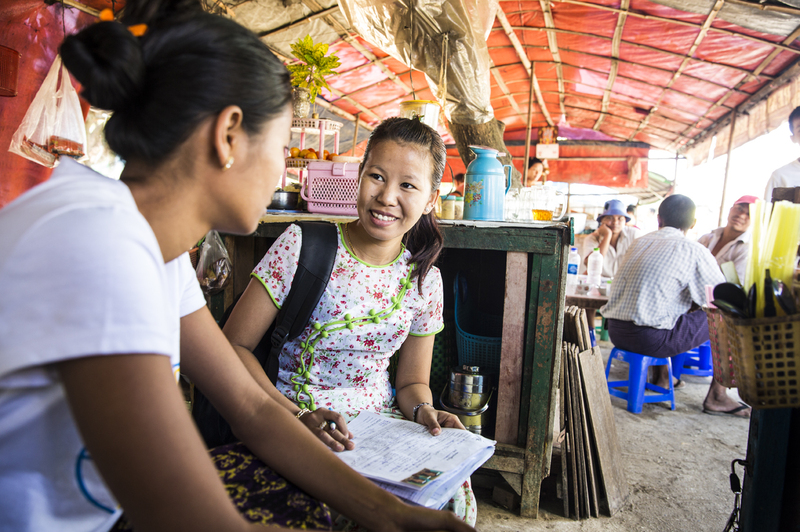 Since 2015, MetLife Foundation has supported Accion’s partnership with Early Dawn Microfinance (DAWN) to provide entrepreneurs in Myanmar — especially women in rural areas — with microfinance services. When we began working with DAWN, it served 25,000 clients with less than $2 million in loans, and loan officers recorded clients’ activity entirely by hand, which could take up to four hours a day. As an investor and operating partner, Accion has worked with DAWN to reach new customer segments, improve and expand its product offerings, leverage new technologies and channels, and improve its operational efficiency. Today, that previous four hours of work takes just 20 minutes, giving loan officers more time to meet with and understand their clients. Now, DAWN is a premier institution that serves as a model for the country’s nascent microfinance industry, serving more than 160,000 clients with more than $30 million in loans. Aye Aye Myint works with women entrepreneur clients at DAWN, our partner in Myanmar. Thanks to the new technology arriving in the country, she’s spending less time on paperwork and more time in the field with clients. Accion, MetLife Foundation, and the Chinese Association of Microfinance launched the first holistic, systematic microfinance management training and capacity building initiative in China. The program involved a hands-on approach so participants could develop their leadership and management skills, as well as sound technical knowledge in microfinance operations and human capital management. The program reached 73 participants from 34 leading microfinance institutions which serve more than one million clients. We recently expanded our partnership with programs that leverage digital solutions to enhance underserved customers’ financial capabilities and engagement. In Latin America, we are working to better understand customer needs and help financial service providers design, test, and implement innovations that drive usage and improve customers’ financial capabilities. In Eastern Europe, we are partnering with Microfinance Centre, a regional microfinance resource center and network of organizations in Europe and Central Asia, to develop and promote digital tools that providers can use to diagnose clients’ financial health, identify gaps, and develop actionable plans to improve their financial well-being. Accion and MetLife Foundation pursue joint opportunities — like content collaborations, speaking opportunities, research, and commentary — to engage the industry and help it better reach the underserved. Accion shares stories of our impact through MetLife Foundation initiatives like the Wall Street Journal’s Multipliers of Prosperity platform and the Next Billion blog. Together, the Center for Financial Inclusion at Accion (CFI) and MetLife Foundation support the Economist Intelligence Unit’s Global Microscope, which benchmarks national progress on financial inclusion around the world and catalyzes reform. And a two-year initiative between CFI, the Institute of International Finance, and MetLife Foundation is using research, knowledge exchange, best practices, real world examples, and expert insights, to identify and share practical guidance that financial institutions can use to expand quality services to the poor. In 2011, CFI launched an initiative using 2020 as a target date to spur the financial inclusion community to more significant impact. MetLife Foundation advised the effort and provided financial support to CFI’s working groups, each tasked with creating a roadmap for a different enabler of inclusion. This effort culminated in a global forum that brought together practitioners and thought leaders in financial inclusion. To help sustain the momentum, the Foundation sponsored several CFI initiatives to develop tools and research for the industry. Today, MetLife Foundation continues to be a thought partner, a collaborator, a funder, and an advisor to Accion, providing critical support for our efforts to build a financially inclusive world.